“Shalom, Shalom, Welcome to the House of Israel” calls the smiling young teen-ager to visitors passing by, while sitting behind a table outside the House of Israel (HOI) in Balboa Park. Who is this amiable and very capable young man, who can be seen every Sunday between noon and 3 P.M. writing names in Hebrew for visitors from around the world? His name is Matthew Soble, and he has been a very faithful volunteer at The House of Israel for almost three years. 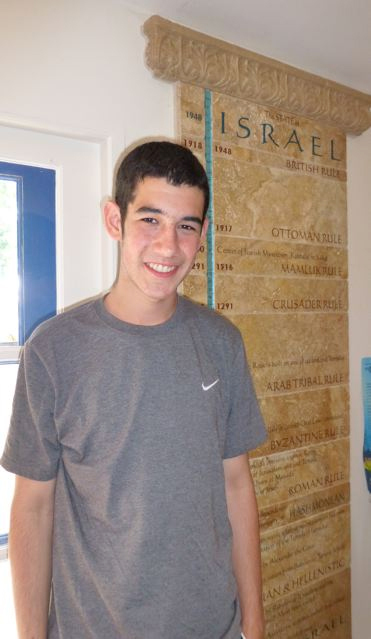 Now 15, Matt not only enjoys printing guests’ names in Hebrew on cards they can wear home and show to friends and family, he also enjoys explaining how the Hebrew alphabet is written and read, and answering visitors’ other questions about the Hebrew language and culture. 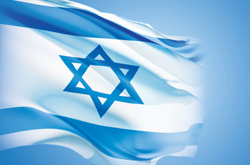 His accumulation of knowledge comes from a variety of sources, particularly from his long-time schooling at Jewish Day Schools in San Diego and his family, who has been very involved in the Jewish community, and whose lives reflect Jewish values. As Matt writes their names in Hebrew, he also tells visitors about the exhibits they can see when they go inside the House of Israel, which depict both traditional and modern Israel, and about what he himself saw and learned when he and his family traveled to the State of Israel two years ago, to celebrate his Bar Mitzvah there. In addition to volunteering at HOI, Matt also has been volunteering , weekly at the Reuben H. Fleet Science Center, where his current title is; ”Museum Ambassador”. Very soon, he will become a “Gallery Facilitator”, where his responsibility will be to answer questions about the museum’s exhibits. This enterprising young man also holds leadership positions in some Jewish youth groups like “J-Teens” and “Chillin with Tefillin” —-and—he has recently interviewed with Kaiser Permanente so he can volunteer there too. When asked “why Kaiser?” and “does that relate to anything you might want to do as an adult,” he explained simply that he is thinking about becoming a brain/cardiac surgeon. Before you go inside to see some of Israel’s latest innovations, be sure to stop by the table outside, and say “Shalom” to Matt —-yes! 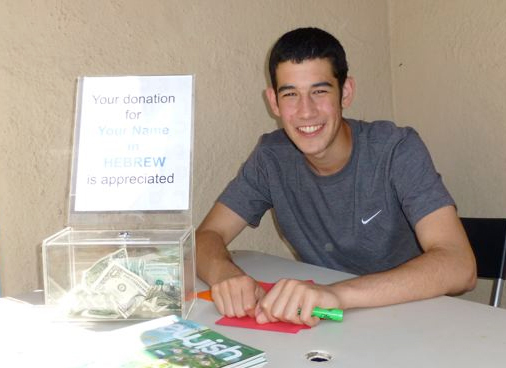 —and maybe even get YOUR name printed in Hebrew, by this very exemplary teen-age volunteer! « Opera in the Park!